To get a hot tub back into a good clean state it is necessary to use a good flush such a the Relax Spa and Hot Tub Flush. Water in any hot tub requires changing on a regular basis (3-4 months) and some 12 hours before the change add the Hot Tub Flush to the skimmer and keep the pump running, remove the filter prior to using the spa & Hottub flush. The Flush will then be passed continually around the system and will clean all the pipes and any parts of the tub that are not easily accessible. 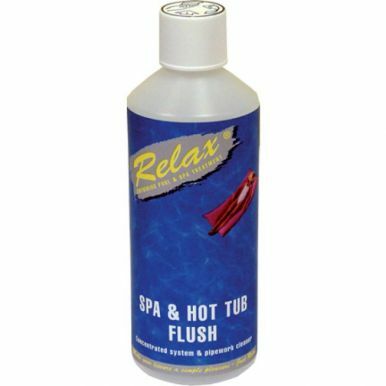 This will remove any build up of harmful bacteria and leave all the pipes and the hot tub in a sparkling condition so that when the water is changed the tub starts from a strong base.